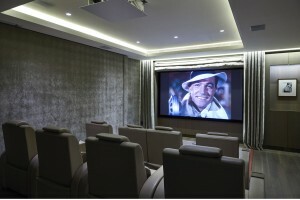 If you’re thinking of installing a home cinema, then a visit to our demo room at our Riverside headquarters is a must. Here we can demonstrate the magic of film on our 75-inch 4K Samsung screen not to mention the powerful, immersive sound of our Triad speakers surround system. 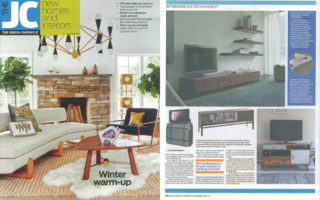 Of course for your own home you can go much bigger screen-wise and personalise the space in a variety of exciting ways. We’ve sound-proofed the walls with Fameed Khalique shaggy leather and sequined wallcoverings, so our demo room certainly dazzles! 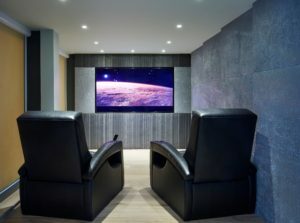 There are lots of options, though, and we’ve plenty of expert advice to share on how to create a perfect home cinema. 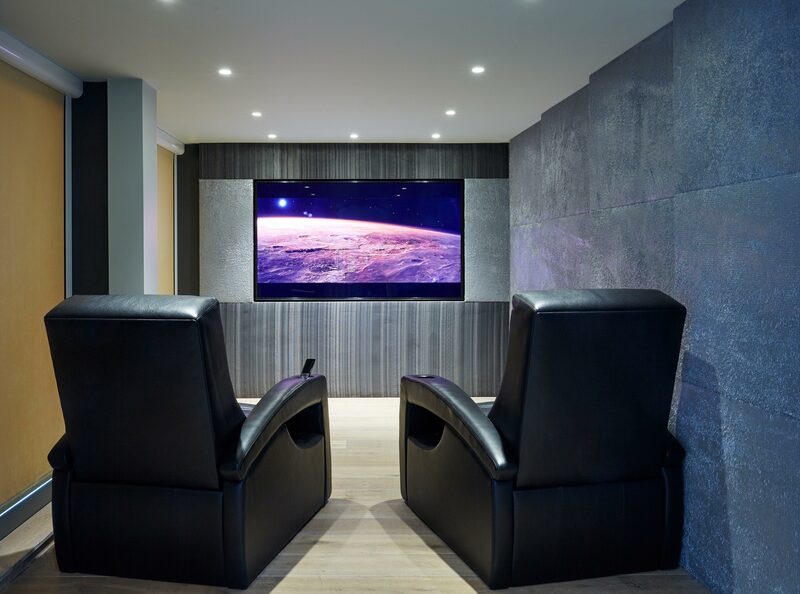 Basements are an obvious place to locate a home cinema and a viewing theatre sits well with other leisure areas such as a games room, gym or spa, so you can make efficient use of any subterranean living space. 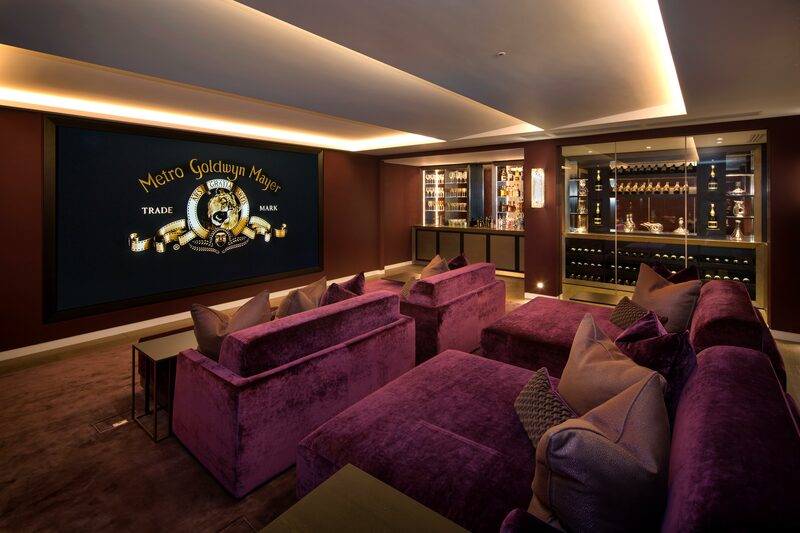 This capacious cinema room features a fully equipped bar and wine cellar adjacent to its cosy seating area, making it the ideal entertainment zone for a big group. 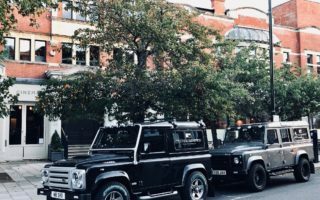 The cinema screen is really wide – an impressive 3.5 metres – and it’s combined with a full HD projector, 5.2 surround sound and Bowers & Wilkins speakers. This comfortable cinema with its 2.97m wide cinema screen and JVC projector is a film-enthusiast’s dream with its big cosy chairs and perfect sightlines. Originally the lower basement space was earmarked for a swimming pool, but the owners felt that a cinema would be much more useful to them, particularly as the pool wouldn’t have been all that long. The addition of a cocktail bar – at the far end of the room – with custom illumination has made this area very popular with guests.